Monday, February 22: Holy Liturgy 10:30 am to 1:00 pm. Tuesday, February 23: Holy Liturgy 10:30 am to 1:00 pm. Wednesday, February 24: Holy Liturgy 9:00 am to 11:30 am. Thursday, February 25: Jonah's feast - Holy Liturgy 6:30 am to 8:30 am. Please note: there is no Holy Liturgy on Friday, February 26. IMPORTANT NOTICE: Please note that there is no Liturgy this Friday, February 19, 2016. 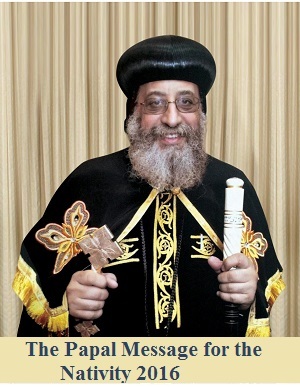 Abouna will be out of Town with the University Group's Reading Week Retreat. Please view regular church schedule under the schedule page. Late Mr. Abdelmalak Yassa, the father of George and his wife Iva, the grandfather of Andrew and Vera, departed to heaven this morning.We have a condolence gathering at St.Mary and St.Abraam, Ajax, Ontario today, Sunday, Feb 7, 2016, at 6.30 pm. May the Lord repose his soul in the Paradise of joy and grant all the family members peace and comfort . Late Mrs. Irene Takla, (Mother of our beloved brother George Takla and his wife Faby), has departed to heaven this morning.The family will receive condolences tonight at St. Mary and St. Abraam Church, Ajax at 7:00 PM .Funeral service will be TBD.May the Lord repose her soul and comfort the hearts of the family. HG Anba Arseny, Bishop of the Netherlands, will bless us by visiting our church on the weekend of Friday, January 29 to Sunday, January 31. His grace will lead the Sunday Liturgy, will join the congregation in the Aghaby meal, and will bless the monthly Holy Family Meeting after the Liturgy. Andrew Matar and Marie-Christine Mikhail Engagement: Saturday, January 30, 2016 at 2:30 pm at church. Click here for invitation. Please note: There is NO Regular Ashya and Arabic Bible Study this Saturday. Raising of the incense will be @ 10:00 pm after the TasbehaScouts and Hymn classes are going to be held after the enagement celebration. The Epiphany Feast prayer, Tuesday, January 19, 2016: Morning Holy Liturgy: 5:30 - 7:30 Am. Evening: The Lakan Prayer and the Holy Liturgy starts at 7:30 pm and finishes at 11pm. Have a very blessed feast. Please note: no Holy Liturgy on Wednesday, January 20, 2016. Baramon liturgy Wednesday, January 6th at 5:30 - 7:30 AM Nativity Feast Liturgy Wednesday, January 6th 7:30 PM and is followed by Christmas dinner for the whole congregation after midnight. Sunday school celebration: Thursday. January 7th at 12:00 PM Second Nativity Liturgy: Friday, January 8th at 9:00 - 11:00 AM followed by the blessing meeting " Seniors' meeting". Arabic message English message To watch click here. New Year's Eve (Thursday): starts at 7:30 pm by the Vesper's prayer (Ahsia), choir and Kiahk praises till mid-night. The Holy Liturgy starts shortly after ending around 2:30 am followed by "Aghapy meal". Happy New Year. Please note: there is no Divine Liturgy on Friday, December 18, 2015.